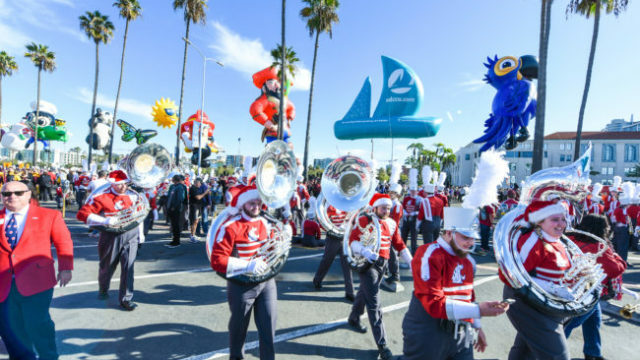 The Washington State football team arrived in San Diego on Saturday, one day after Michigan State, its opponent in Thursday’s 40th annual Holiday Bowl at SDCCU Stadium. The Cougars are staying downtown at the Marriott Marquis San Diego Marina and will practice at Southwestern College in Chula Vista. There are five Washington State players from San Diego County high schools, including redshirt freshman starting linebacker Jahad Woods, a Helix High School alumnus. Michigan State players arrived at Lindbergh Field Friday from Detroit and are staying at the Manchester Grand Hyatt in downtown San Diego. The Spartans practiced for 2 1/2 hours Saturday at Mesa College in Clairemont, then lifted weights. The team went to Mission Beach after practice. Washington State is set to visit Sea World Monday, the same day the Spartans visit the San Diego Zoo. The teams will jointly visit the amphibious assault ship USS Essex Tuesday. 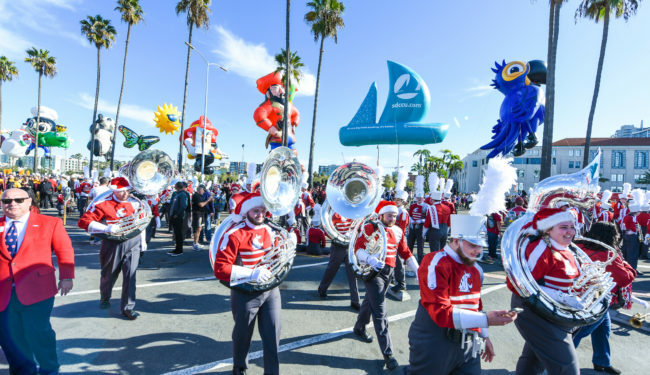 The annual Holiday Bowl Parade — America’s largest balloon parade — is scheduled for Thursday, starting at the San Diego County Administration Building on the north Embarcadero at 10 a.m. Both teams are 9-3. Michigan State started the season 7-1, then lost two of its next three games. The Spartans concluded the regular season with victories over Maryland and Rutgers, tying Penn State for second in the Big Ten Conference’s seven-team East Division, one game behind division champion Ohio State. The Cougars began the season 6-0, including a 30-27 victory over eventual Pac-12 Conference champion USC, then lost two of their next three games. Washington State lost to Washington, 41-14, in their final regular- season game, finishing third in the six-team North Division. The Spartans will make their first Holiday Bowl appearance and first appearance in California since the 2014 Rose Bowl Game when they defeated Stanford, 24-20.The Cougars will make their second consecutive appearance in the Holiday Bowl and fourth overall. Washington State lost to Minnesota, 17-12, in 2016 and to Brigham Young, 38-36 in 1981, in a game it trailed 31-7 early in the second half. The Cougars lone Holiday Bowl victory came in 2003 when they defeated Texas, 28-20.